mp3s :: The Last Parts & Labor Mixtape? 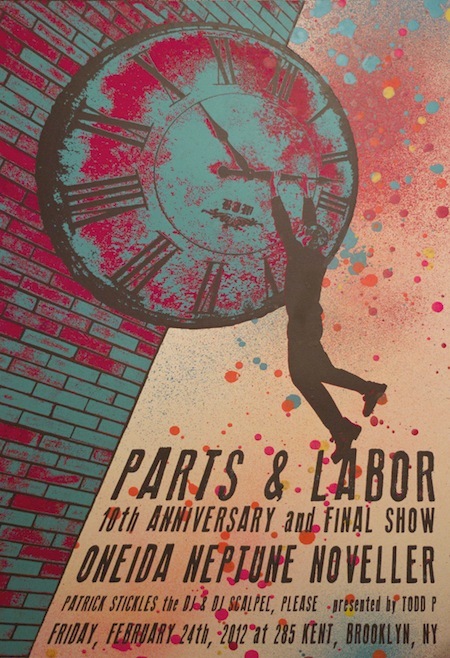 So, Parts & Labor will be playing their final(?) show tonight at 285 Kent with Oneida, Neptune, and Noveller filling out the bill. Disc jockeying duties will be performed by Patrick Stickles the DJ and DJ Scalpel, Please. Jokes about reuniting to cash in will be told. Some (but probably not all) of these songs will be played. Here is the last Parts & Labor mixtape. You can purchase lots of Parts & Labor merch @ partsandlabor.net. You can check out a much more extensive playlist of Parts & Labor, Oneida, and Neptune on Spotify (sorry no Noveller available). You can read a recent interview with the band @ villagevoice.com. Also, make sure you check out 10 Years of Parts & Labor @ imposemagazine.com. If you want to download all the individual tracks in this post, you should probably think about installing the DownThemAll! or FlashGot Firefox extensions as we are way too lazy to zip and upload every mix we make.